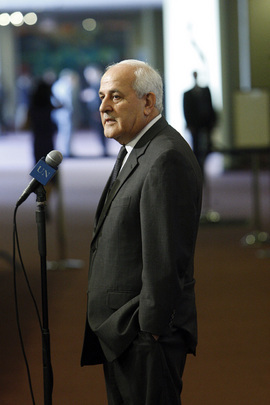 UNITED NATIONS, March 5 -- The United Arab Emirates is considering submitted to the UN Security Council's terrorism list the names of "those terrorists" who assassinated a Hamas leader in Dubai, Palestine's Permanent Observer to the UN Riyad Mansour told the Pres on Friday. Inner City Press asked Ambassador Mansour if his delegation wanted to raise to the UN the assassination in Dubai. We leave that to our brothers in the UAE, Mansour answered, it is a matter of sovereignty for them. Video here, from Minute 8:47. The UN's "terrorism list," as Mansour put it, is a list pursuant to Security Council Resolution 1267. Al Qaeda and the Taliban are on it, as is the shadowy and some say non existent East Turkestan Islamic Movement ascribed to Western China's Xinjiang Uighur Autonomous Region. The inclusion of "agents of Mossad" would be something new. In fact, as one correspondent pointed out later on Friday, the 1267 Committee has recently tried to provide more due process to those on the list, along it still require unanimity on the Council to be removed from the list. But might the procedural improvement benefit Mossad? Most say there is no chance that the Dubai hit men will be added to the list. Mansour was speaking to the press -- two reporters, to be exact -- after the Gabonese president of the Security Council for March, Gabon's Emmanuel Issoze-Ngondet, read out a one paragraph statement about the "provocations" of both side in the Middle East. Inner City Press asked if the reference was to the skirmish between Palestinians and Israeli forces on the Temple Mount that day. The Council president refused to answer even this, walking away from the microphone. Mansour nevertheless called it a strong statement. Video here, at end. Inner City Press asked Mansour if the "provocations" might also refer to Israel's recent listing of National Heritage Site. Video here, from Minute 6:47. Mansour said yes, referring to "site of heritage for Zionism." And so it goes at the UN. 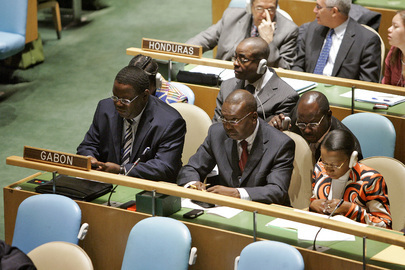 Footnote: In fact, after the Gabonese president read out the statement that began "the members of the Council expressed their concern," the U.S. Mission to the UN claimed to reporters that it had not agreed, that the statement was only adopted due to "procedural confusion." Inner City Press say U.S. number three official Rosemary DiCarlo leaving the Council before the statement was read. Some asked, where was Susan Rice?